Tag Archives for " Heena Banga "
As per the latest research, social media ad spend overwhelmingly surpassed television by the end of 2016- a result that wasn’t predicted. Initially, it was estimated that TV would be on top until 2017 but surprisingly social channels overtook the tv numbers very early this year. Additionally, it’s predicted that the amount of money spent on social media advertising is set to catch up with newspaper ad revenues by 2020. While advertising has always worked for all types of businesses, more and more marketing professionals (especially small businesses, enterprises and SMB’s) are accepting the shift in advertising strategy. Digital working and leisure have taken the world by storm and so have mobile phones. With mobility (provided by smartphones) and mobile app development, people are more connected on-the-go on digital platforms. It opens the door for marketers to share their brand story with millions and billions of people active on various social channels. In fact, Facebook, Instagram, YouTube, LinkedIn are effortless and straightforward. The only thing that they require is a strategic move, which includes the right timing, right targeting, right budget and the right content to connect with the audience and work for big numbers (shares, likes, followers, comments). On the contrary, it may pose a challenge to many digital marketers as with plenty of channels, it becomes difficult to devise an action plan that hits a grand slam. Because each of the channels requires individual creative handling. There is always that anxiety to get started. As you get on the advertising front, growing your follower audience is most important and for that, we’ve created an all-embracing guide to social media advertising that will definitely work for startups, businesses and small-medium enterprises. Before we begin, let’s understand what is a social media ad. It is a paid (mostly) content on any social media channel that connects the masses via desktops, laptops, tablets and mobile phones. A promotional tweet to Facebook post to influencer marketing on Instagram to a full-scale video on YouTube, the options can be many. Depending on the ad objectives, you can use several different ad formats that Facebook offers. Advertising runs a gamut of choices- from very simple to a full-fledged campaign. We can’t get into each of the techniques but we can understand few of them. If you really want to increase your traffic, remember that Facebook continues to be the most widely used social media platform across the globe. For businesses that don’t have a dedicated Facebook page and don’t want to show their message as a news feed, choose the audience to reach directly to the website through a domain ad. A relevant title, a short description with website URL can be useful for lead generation. These are Newsfeed ads that feature a wide, eye-catching image to gain user’s attention. After posting the ad, you can easily test both the post text and link description. To boost engagement, remember to check comments and proactively reply to them. Primarily for E-commerce advertisers, who are in the horde of promoting multiple products from their store through a single ad strip. Such ad types are available in news feed, similar to page post link. The difference lies in the number of links (up to 5) that can be featured at one time. An intuitive and interesting way of showing your products on the full screen of a mobile device. It keeps the users on the Facebook interface (no external links) and allows them to scroll through a carousel of images, zoom in/zoom out, tilt them in different directions and so on. A visible call-to-action for users to immediately like your page, it’s a go-to ad technique to increase your page likes. A crucial option for startups so should be supported by a high-quality image to achieve great performance. More importantly, the page like advertising demands a targeted audience, not the cheapest likes. 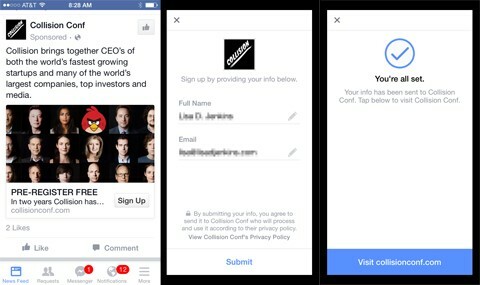 To build an offer advertisement, Facebook demands a minimum of 50 likes on your page. Provides a clear call-to-action if the offer is lucrative and allures the users. To connect with the existing audience and create new customers, invite people to your upcoming events informing them about the venue, dates, time. Most local brands apply this trick and it works. You can also limit the geographical reach of the ad. Facebook has provided the ease of generating leads right from the platform through lead generation ads. You can capture user’s interest in your products and services and guide them through the sales funnel. A lead is generated when users are already warmed up to a bit. This is what businesses have to work for – collect information from your potential customer and ‘warm’ them up. Once an initial attraction is sparked, leads can then be converted into a customer. They’ll click the call to action to populate a form prefilled with their personal information, which can be reviewed and edited. If they choose to submit, you are very close to making a customer/prospect/client. Continuously growing over the years, Twitter has gained significance in the hearts of more than 300 million users now. Twitter’s brand-friendly platform is a great way to connect with people, manage customer service and bring real value to business. Doubling the number of eyes on your tweet content, promoted tweets are simply paid ads to display to people who have not been following your account yet. Similar to regular tweets, they can be retweeted and liked. It is an impactful twitter technique to drive engagements. The code is to create an impressive tweet like pushing a product release crafted well enough that it appears on top of search results. A recent 2016 report reveals that 85% audience believe that promoted accounts help them discover new businesses. These advertisement techniques are meant for a targeted audience in order to simply promote your account and gain relevant users. Promoted accounts can be seen directly in ‘Who to follow’ suggestions, search results, and potential followers’ timeline. Like Facebook’s news feed, trending topics on Twitter are most talked about subjects that appear on the left side of the page or app. It allows you to promote a hashtag or a story at the top of the list. If people choose to use your hashtag, you can gain an organic exposure for your advertising campaign. Besides, there are several other ad campaigns that businesses can choose to either increase engagement or gain several followers. Depending on the campaign objective, you opt for an ad type and hence, pay for it. Tweet engagement campaigns allow you to promote tweets that are published organically or to the specific (targeted) audience. Adding media to the tweet and including a hashtag always work for improved engagement. The best part is you only pay when targeted users engage with your content; other impressions are free. Use them for brand equity, offline sales, retweets, brand publicity, product releases. This campaign lets you create lead generation cards that collect leads and you pay for per lead collected. The cards allow users to share their details including name, email address, Twitter handles directly within the Twitter interface. It is an automated process. As the name tells, a video view campaign is all about the users who view your ads. That can be a promotional video, a short clip, an interesting script for your services, latest offers and discounts. You pay only if a user sees two seconds of playback in the timeline, unmutes the video or clicks to watch in full screen. Starting a video marketing campaign is a brilliant idea in today’s time as millennials connect more with video content than just plain text. To promote your enterprise/business app, you can choose a set of audience who would want to download your mobile app or who have downloaded it but was not active for a while. The ad campaign includes an app card that displays your app image along with user rating. Users can either open or download the app, with a single click. LinkedIn has transformed from a teensy professional networking website to a world force platform. Now you can also make connections and grow your business from the mobile app. With over 430 million members including individuals, business groups and Fortune 500, LinkedIn ads allow you to target professionals and decision-makers with relevant content. From basic company profile to making leads from LinkedIn, it gives the best way possible to B2B marketers. Of the five major social media platforms, LinkedIn is the most effective for generating leads directly. Your company page can be turned into a lead generation page. All you need to do is use an image that gets attention, create a compelling pitch in your description and make your recent updates section clickable and conversion-focused. LinkedIn advertising also promotes individual brands (that are extensions of the company) through showcase page. These pages are yet another form of lead generation as they are intended to develop a long-term relationship with a specific audience. A showcase page mainly targets one customer segment; must be made up of a header image, back links to your company website and striking content. 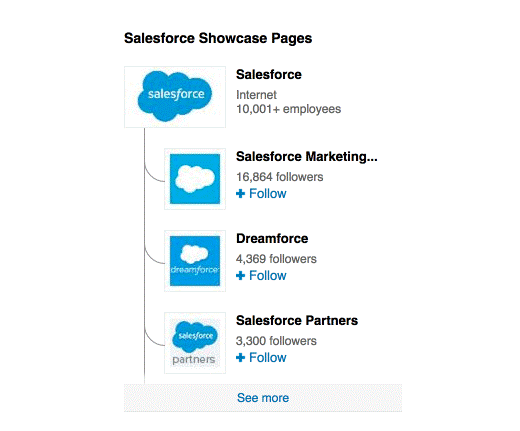 Leading company like Salesforce has more than one showcase pages. These are some broad level strategies that leave you lots of room to track down more precise strategies for marketing and advertising. Social media channels offer ample opportunities that are highly connecting and reliable resource for B2B marketing. However, without the right knowledge, it becomes just another time-sucking trick. Next time you are on any of these platforms, spend at least 30 minutes doing some advanced research and implementing a stimulating ad banner. I bet if you don’t come up with at least five prospects. It’s just the beginning, and it can very well turn into your next B2B or B2C conversion. What is your experience with advertising on social media platforms? Share with us in the comments section below. We’d love to hear from you. 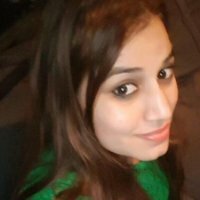 Heena Banga is a Senior Content Developer at Konstant Infosolutions- a globally recognized mobile application development company. She leads marketing and growth initiatives at the company using a mix of technical and business content tactics. Heena also contributes articles to CrowdReviews, OpenSourceForU, Sociableblog. She hopes to enjoy a business conversation onboard a commercial space flight someday.